“Sobek and Horus represent two powerful opposing psychic forces found in all human beings – the old and the new parts of each of us. They appear together as adversarial allies to hep us reconcile opposing forces and create harmonious, balanced union within. The crocodile god, Sobek, represents strength and fortitude, fertility and rebirth. From Sobek, we inherited the reptilian brain that contains the ancient evolutionary patterns. It rules the autonomic functions that have kept us protected to grow forward. Horus is the son of Isis and Osiris. In this oracle he comes into maturity and prepares to step into his full power as the enlightened ruler. All pharaohs are called Hours. As a hawk headed diety, he is associated with higher mental and spiritual functions. If you have drawn this card, it is time to take a deeper look at the energetic desire to evolve while stepping into a new way of being. You may experience a sense of conflict from the old self. In truth, it is willing but needs to know that what is of value will not be lost and that mistakes will not be repeated. This is an opportunity to take stock of the newer self that wants to evolve and step forward, and of the old self that wants to make sure you have a solid foundation to stand on. The only way to truly move forward is to release all the old. Old thought patterns and conditioning. Old ways of thinking and of being in the world. This may involve great changes, releasing people and situations; even moving house, changing jobs or going in a completely different direction. In order to do this, you will have to forgive those who were placed in your life to teach you lessons that have made you uncomfortable or caused you any pain or trauma. This is not always easy to do, yet if we don’t release them from the grip of our pain, it is us who eternally suffer. It does not mean that you condone the behaviour, it means that you forgive and move on so that you do not attract these same patterns or lessons any more. You are done with all that. See yourself standing in front of the person you need to release. If there are more than one, then do one at a time. Look this person right in the eye and tell them: “I forgive you, I release you.” Then feel yourself quite literally sprouting wings and spreading them wide. See yourself fly right through the sacred space created by Sobek and Horus on the card image as they hold safe space for you. Look up and see yourself fly high above the person you are releasing, looking down upon them standing there alone, getting smaller and smaller as you soar high above. Allow yourself a couple of deep breaths and take in the idea that you are now completely free of this burden you have been carrying. You are light, you are free and you are able to detach from all the drama that this person has caused you. You never have to fly back down to them and experience this pain again. If you choose to have this person stay in your life, set the intention that your relationship with them will start anew, with you being fully empowered and you will never lose your freedom to them, or anyone else, ever again. 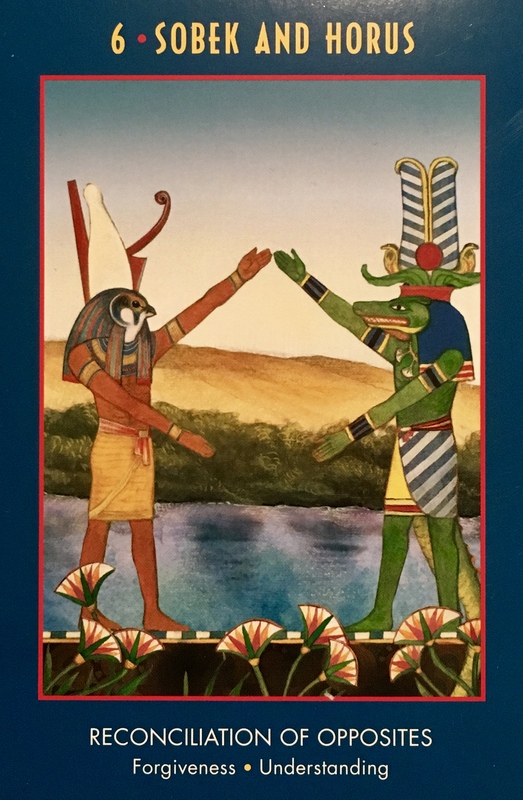 Know that Sobek and Horus will always provide this safe space for you to forgive and release all those who are holding you back in your life or causing you any pain. Thank you Dee…I just got advice in the past month of making sure you imagine a love one or a peaceful place to go to after you release them so you are not just standing there – you free yourself from the energy. You leave them, the negative energy of the one who has wronged you and go to a more positive loving energy. I think that is key in the final end. This is so relevant and timely. I even dreamed last night of receiving many gifts from many people.Thank you for clarifying it so well.